Peptide (C)EEAGPAGEPRGSQAS, corresponding to amino acid residues 147-161 of human HCN2 (Accession Q9UL51). Intracellular, N-terminus. 1. Anti-HCN2 Antibody (#APC-030), (1:200). 2. Anti-HCN2 Antibody, preincubated with the control peptide antigen. Rat thalamus lysate (Whitacker, G.M. et al. (2007) J. Biol. Chem. 282, 22900.). Immunochistochemical staining of rat cerebellum frozen sections using Anti-HCN2 Antibody (#APC-030 ). 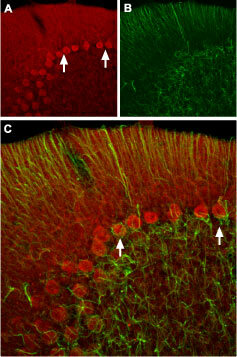 A. HCN2 (red) appears in Purkinje cells (arrows). B. Staining of astrocytes with mouse anti-glial fibrillary acidic protein (GFAP, green demonstrates the restriction of HCN2 to neuronal cell bodies. C. Confocal merge of HCN2 and GFAP images demonstrates the respective localization of these proteins. Immunohistochemical staining of mouse hypothalamus using Anti-HCN2 Antibody (#APC-030). 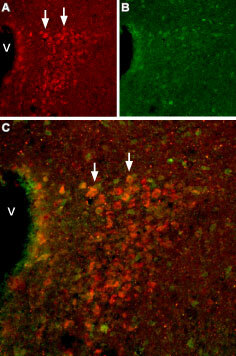 A. HCN2 (red) appears in cells of the paraventricular nucleus (PVN, arrows). B. Staining of paraventricular nerve cells with mouse anti-calcium binding protein (CBD28k, green). C. Confocal merge of HCN2 and CBD28k demonstrates some co-localization. V = Third ventricle. Immunocytochemical staining of paraformaldehyde-fixed and permeabilized rat dorsal root ganglion (DRG) primary culture using Anti-HCN2 Antibody (#APC-030), (1:100), (green). Cells were stained with Anti-HCN2 Antibody followed by goat anti-rabbit-AlexaFluor-488 secondary antibody. 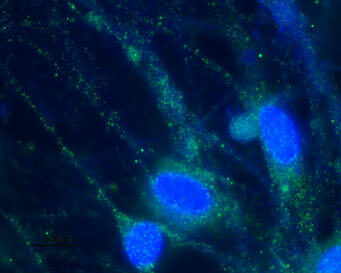 Nuclear staining of cells using the cell-permeable DNA dye Hoechst 33342 (blue). Much, B. et al. (2003) J. Biol. Chem. 278, 43781. Notomi, T. et al. (2004) J. Comp. Neurol. 471, 241. Hofmann, F. et al. (2005) Pharmacol. Rev. 57, 455. Knockout validation of Anti-HCN2 Antibody in mouse brain.Immunohistochemical staining of mouse coronal brain sections using Anti-HCN2 Antibody (#APC-030). HCN2 staining (red) is broadly detected across the coronal section. Lack of HCN2 staining is observed in HCN2-/- mice. Adapted from Hammelmann, V. et al. (2011) PLoS ONE 6, e17078. Anti-HCN2 Antibody (#APC-030) is a highly specific antibody directed against an epitope of the human protein. The antibody can be used in western blot, immunoprecipitation, immunohistochemistry, and immunocytochemistry applications. It has been designed to recognize HCN2 from human, rat, and mouse samples. Immunohistochemical staining of mouse brain sections. Also tested in HCN2-/- mice. Hammelmann, V. et al. (2011) PLoS ONE 6, e17078. Human sinoatrial node lysate (1:500). Li, N. et al. (2015) Circ. Arrhythm. Electrophysiol. 8, 1219. Whitacker, G.M. et al. (2007) J. Biol. Chem. 282, 22900. Negrini, D. et al. (2016) Am. J. Physiol. 311, H892. Human sinoatrial node sections (1:100). Horwitz, G.C. et al. (2014) J. Gen. Physiol. 143, 481. Mouse brain sections. Also tested in HCN2-/- mice. Cao Ehlker, X. et al. (2013) J. Biol. Chem. 288, 7580. Nakashima, N. et al. (2013) J. Physiol. 591, 1749. Rusznak, Z. et al. (2013) Eur. J. Neurosci. 37, 876. Ramakrishnan, N.A. et al. (2012) J. Biol. Chem. 287, 37628. Doan, T.N. et al. (2004) J. Neurosci. 24, 3335. Jiang, M. et al. (2004) Circulation 109, 1783. Macri, V. and Accili, A.A. (2004) J. Biol. Chem. 279, 16832. Han, W. et al. (2002) Circ. Res. 91, 790. Moroni A. et al. (2001) J. Biol. Chem. 276, 29233.